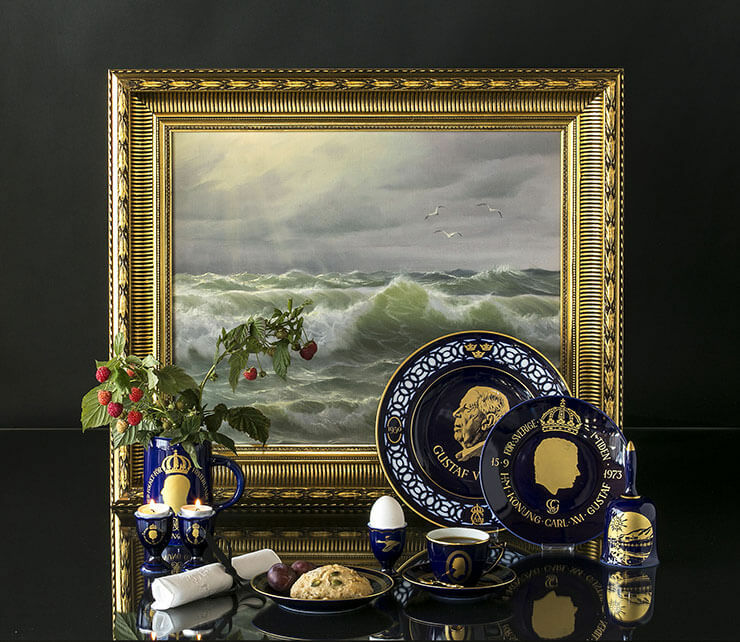 Both Royal Copenhagen and Bing & Grondahl have through the years issued many plates that celebrate the royal families and have at special occasions of the Royal house issued memorial plates to celebrate the occasion. Bing & Grondahl has also issued a series of Danish kings through the ages along with a similar series of Swedish kings. Bing & Grondahl has on several occasions shown their support to the Danish Royal Family by posting plates on the occasion of joyful events within the royal family. In connection with Queen Margrethe II's accession to the throne on 14 January 1972, the factory published a plate in white porcelain decorated with the Queen's monogram in gold, surrounded by the Queen's motto: God's help, people's love, Denmark's strength. In the event of King Frederik IX's death, B&G released a similar plate with the date of his birth and date of his death. Also the foreign royal houses have been honoured by Bing and Grondahl commemorative plates. The factory produced a series of porcelain plates in royal blue with a beautiful lace in white and motifs of Nordic kings for 1000 years. Some of the motifs were decorated with a fine gold bar, others are all in white. On the occasion of the British Prince Charles and Lady Diana's wedding, there was also released a beautiful commemorative plate from Bing & Grondahl with motif of both of them seen from the side and surrounded by a fine rim in royal blue. B&G has published a beautiful series which depicts the Danish kings through the years. The series consists of twelve plates in colour, designed by Ivan Falkenberg. All plates are surrounded by a wide border in brown and blue colours with four circles in which each king or queen's reign and monogram is engraved. Bing & Grondahl King plates are 23 cm in diameter.